Stinking hot night. Tired. Poor meal planning. No proper shop done for the week. Cranky Ankle Biters. Thank goodness for tuna salad. In our house its something that everyone loves. It’s a quick and easy way to get heaps of vegetables with a good protein punch into everyone (carbs too if served with bread or if you add potato). It’s budget friendly and best of all it’s malleable. 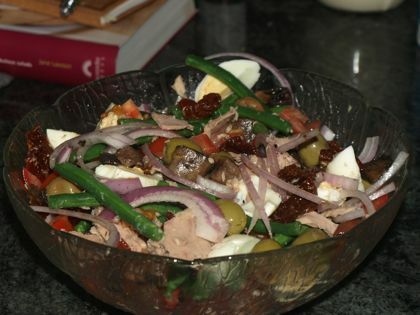 Whatever you have in the house, as long as there is tuna, it can be turned into some variation of a tuna salad. Best of all, it’s ready in 10 minutes. This was my latest version. I left this one undressed, between the myriad of ingredients, the juices from olives and capers and the oil from the sundried tomatoes, it really didn’t need any more added flavour. Everyone had seconds. ‘Nuff said. Again – what can I say – superfast AND healthy to boot.